A Status Orange snow-ice warning has been extended until midday on Monday for Leinster, Cavan, Monaghan, Cork, Tipperary and Waterford. A Status Yellow snow-ice warning has been extended until midday Monday for Connacht and Donegal, Clare, Kerry and Limerick. Met Éireann has said there will be a risk of localised flooding due to rising river levels, while the National Emergency Coordination Group has said melting snow may result in localised surface water. People are advised to watch for accumulations of melt water which could lead to flooding. ESB continue to work to restore power today to over 4,000 customers in the Wexford area. Irish Water are urging people to conserve water. Due to critically low levels in the Carnes and Balloy reservoirs and a high demand a water outage will impact 12,500 customers in East Meath from this afternoon. Irish Water also said water supplies in parts of Dublin may have to be restricted because of a surge in usage. Overnight water restrictions are in place in parts of Mayo, Longford, Westmeath, and Galway. Most schools are expected to re-open tomorrow unless in specific circumstances and areas which remain affected by deep snow. In Wexford town, all second level schools closed tomorrow. In Wicklow, Avondale Community College is closed. In Kildare, Salesian College Celbridge is closed as a result of damaged, St Wolstan's in Celbridge also closed. Bus Éireann school transport services will resume tomorrow morning, dependent on local road conditions and possible school closures. An Office of Public Works High Tide Advisory notice remains in place until Monday. The HSE has cancelled all non-urgent surgeries planned for Monday and has said there is no need for patients to contact their hospital. Hospitals will be in touch over the coming weeks to reschedule their appointments. Outpatient clinics, elective and routine procedures will go ahead as planned at each of the three Dublin children's hospitals tomorrow. Patients who had appointments cancelled last week will be contacted by the relevant hospital directly to reschedule their appointment. The HSE has said that home care provision has also been affected by the heavy snowfall. It is asking people to consider checking in on elderly or vulnerable members of the community. 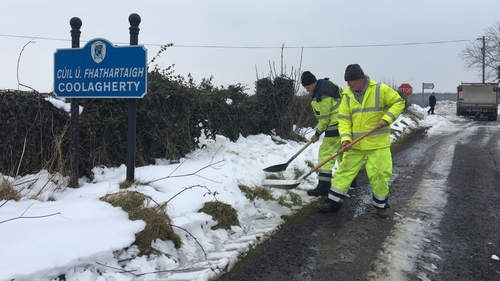 The Health and Safety Authority has urged caution for those returning to work after the storm. The main road network, with some exceptions, is reopened. Motorists need to exercise caution and drive at speeds appropriate to the conditions. Dublin Bus services are operating with disruptions to scheduled services. A full DART services has resumed, while Iarnród Éireann has said all routes have returned to normal with the exception of Connolly to Rosslare, M3 Parkway to Clonsilla, and Limerick to Ballybrophy via Nenagh. The Luas Green line service is operating a full service from Brides Glen to Broombridge in both directions, with no restrictions. The Red Line will also be running a full service, with a buses transporting passengers between the Belgard and Saggart stops. Flights have been taking off and landing at Dublin, Shannon, Cork and Ireland West airports, with Aer Lingus expected to operate a full schedule. Dún Laoghaire Rathdown County Council in Dublin has urged cyclists to consider leaving their bikes at home on Monday and to use public transport instead. Many shops are re-stocked and open for business today. Government Departments, Offices and Agencies will be open on Monday. Some decisions to open will appropriately be made locally in the badly affected areas.